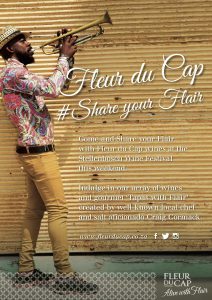 Come and Share your Flair with Fleur du Cap wines at the iconic Stellenbosch Wine Festival this weekend; 24 – 26 February 2017. At this three-day event Fleur du Cap will showcase an array of their wines, produced at the famous Bergkelder in Stellenbosch. Visitors will be able to sip on the Natural Light range, which will be ideally suited to the hot afternoons, or savour the more delicate, yet bold Unfiltered range. Take your culinary inquisitiveness even further by joining one of our tasting sessions at The Tasting Room. Spend 30 minutes with one of the Fleur du Cap winemakers while they guide you through a journey of food and wine.